SmashZone, the interactive fan attraction featured annually at the US Open, made a special stop at Missouri Southern State University on Thursday, June 30, in an effort to help boost the spirits of the children and families affected by the tornado that hit Joplin, MO, this spring. The USTA announced it will donate $100,000 to the city of Joplin to assist with disaster relief efforts in the tornado-stricken community. The USTA announced it will donate $100,000 to the city of Joplin, Mo., to assist with disaster relief efforts in the tornado-stricken community. The USTA is committed to helping rebuild Joplin High School and its tennis courts, which were demolished in the storm. In addition, the USTA will bring SmashZone, the interactive fan attraction featured annually at the US Open, to Missouri Southern State University on Thursday, June 30, from 10am – 3pm CT, in an effort to help boost the spirits of the children and families affected by the disaster. The event is free to the public. The USTA Missouri Valley Section coordinated efforts to involve the tennis community in helping victims of the tornado through a donation organized by the Joplin Schools Tornado Relief Fund. The USTA contribution consists of a $25,000 donation from the USTA Missouri Valley Section, a $25,000 donation from USTA National, and a $50,000 grant for refurbishment of the high school tennis courts and technical assistance. In addition to its $100,000 donation, the USTA is working with tennis manufacturers and retailers to collect additional donations including equipment and tennis gear for the Joplin High School tennis team. "The USTA is committed to help rebuild Joplin and assist its tornado victims," said Jon Vegosen, USTA Chairman of the Board and President. "By having our SmashZone Mobile Tour come to Joplin, we hope to provide the community an outlet for a day to enjoy themselves and the sport of tennis." To further support this effort, the USTA will complement its official Davis Cup Draw Ceremony for the upcoming quarterfinal tie vs. Spain in Austin, Tex., with a concert featuring the Grammy Award-winning band, Asleep at The Wheel. The event will be held on Thursday, July 7, at Austin City Limits Live at The Moody Theater. Tickets for the Draw and concert are priced at $5 plus fees, with all the USTA’s proceeds going to the Joplin Schools Tornado Relief Fund. 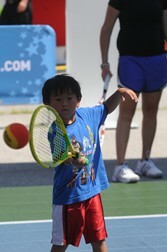 The Mobile SmashZone includes four kid-sized tennis courts for youth play and various interactive activities, allowing kids and their families to test their tennis skills. The USTA also will distribute tennis equipment to the kids at the event and to local tennis organizers to help support their summer and fall programs. "We’re excited to bring SmashZone to the Joplin area," said Mary Buschmann, USTA Missouri Valley Executive Director. "It’s an opportunity for the community to gather and have a fun day amid the devastation and clean-up." The USTA is encouraging its 750,000 plus members and others interested in donating to tennis and education programs in the Joplin area to donate to USTA Serves, the organization’s philanthropic arm, through USTAServes.com.